The LeanJet® RB-8 immersion cleaning system processes eight (8) baskets of parts per cycle, up to eighty (80) baskets per hour. 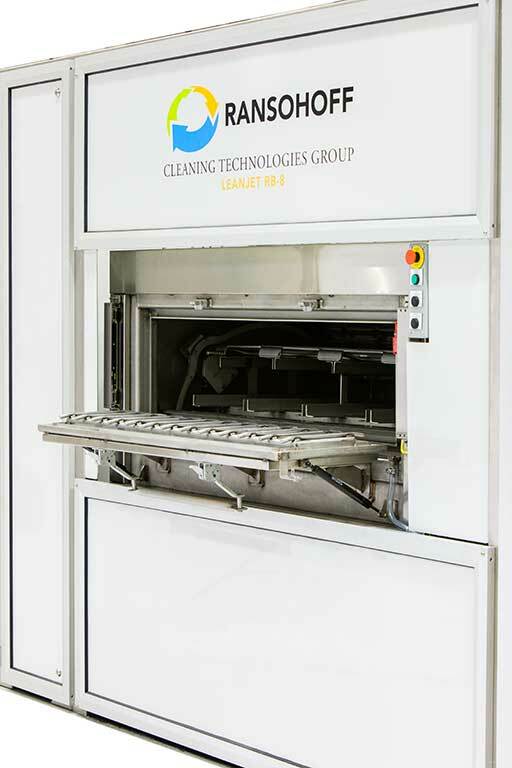 The ImmersoJet HC, (High Capacity) parts washer, cleans using our washing and rinsing process of agitation, spray impingement, hydraulic purging through immersion and rotation, and heated blow-off drying. Our "triple action" batch cleaning process was developed specifically to process a broad range of challenging parts, especially those with internal bores and passages. In addition, the ImmersoJet system is designed to be equipped with ultrasonics if needed. Cross contamination or "carryover" of expensive wash solutions is minimized by our unique divert drain system which handles inter-stage solution management. This feature is combined with quick release drain actuators that rapidly discharge contaminant-laden solution to the tanks and away from your clean parts. As a standard design parts are processed in the industry standard Kadon style basket designed to hold and protect your delicate parts during the entire cleaning process. Our carriage can be modified to accommodate your current baskets or new, custom fixtures.